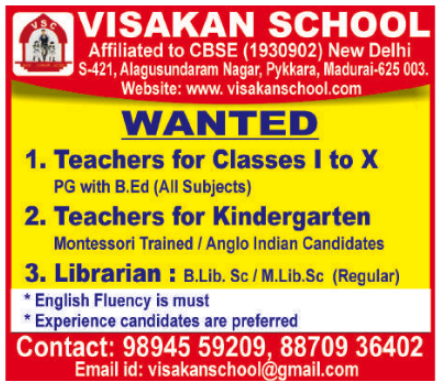 Visakan School, Madurai has advertised for recruitment of Teachers / Librarian jobs vacancies. Interested and eligible job aspirants are requested to apply immediately from 02nd December 2018. Check out further more details below. About School: Visakan School follows the CBSE Syllabus through English medium. We provide education with an objective to empowering students to sit for the CBSE Board and train our students accordingly using the NCERT syllabi in the following subjects. Communicative English, Indian language (hindi), Mathematics, Science, Social Science. How to Apply: Interested and eligible candidates are requested to send detailed resume through email along with copies of certificates and PP size photos.